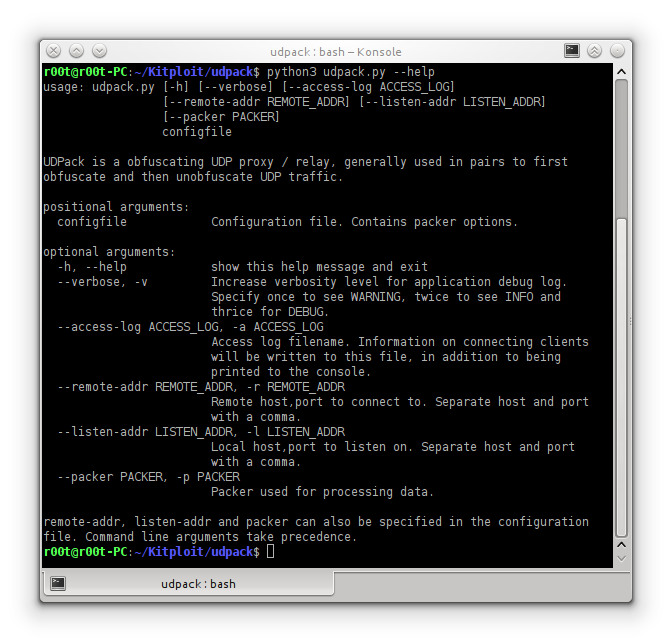 UDPack is an extensible generic UDP packet obfuscator. The purpose of this application is to sit in the path of a UDP data stream, and obfuscate, deobfuscate or otherwise modify the packets. Python 3.4 or above is required, since this script uses the asyncio library. Currently there are no other dependencies. Warning: It must be stressed that the purpose of this application is obfuscation , not encryption . Many design decisions have been (and will be) deliberately made against best practices in cryptography, so in all likelihood the obfuscation methods will not resist crypto analysis. DO NOT rely on the obfuscation for confidentiality of your data!!! A "packer" is a particular implementation of obfuscation method, usually obfuscating packets travelling upstream and deobfuscating packets travelling downstream. An "unpacker" is the same thing, implemented in the opposite direction. In most cases, to implement a new packer, simply inherit from UDPackStraightThroughPacker and implement pack and unpack methods. To implement the corresponding unpacker, inherit from UDPackUnpackerMixIn and the completed packer.